Daniel was part of the Gibson group as a MChem student (2010-2011), PhD student (2011-2014) and as an Early Career Fellow at the Institute of Advance Study (2014-2015). He now works at Infineum. See below for details of Dan's work whilst a Gibson Group member. Daniel was born and raised in Bedford, studying for GCSEs (2003-2005) and A Levels (2005-2007) at Sharnbrook Upper School and Community College. He began studying for an MChem in Chemistry at the University of Warwick in October 2007 and graduated in July 2011. As part of his degree, he completed a 12 month Industrial Placement in the "Analytical Sciences" department of MSD UK. Whilst here, his work focussed on: (i) the physical characterisation of a series of Active Pharmaceutical Ingredients (APIs); (ii) assay, content uniformity and automated dissolution (USP I, II and IV) method validation and development and (iii) development of biorelevant dissolution technologies. In addition, he gained valuable experience using techniques such as HPLC, XRPD, DSC, TGA and DVS. In 2010-11 he completed his Masters project under the guidance of Dr Matthew Gibson, working on the preparation of bioreducible, responsive polymeric materials whilst learning the art of controlled radical polymerisation techniques such as RAFT and ATRP. In 2012, Dan was elected as founding Chair of the Student Association of the Academy of Pharmaceutical Sciences (SAPS). This group seeks to enhance interactions between students and professionals within the Academy of Pharmaceutical Sciences (APS) and beyond. For more information click here, or get in touch! 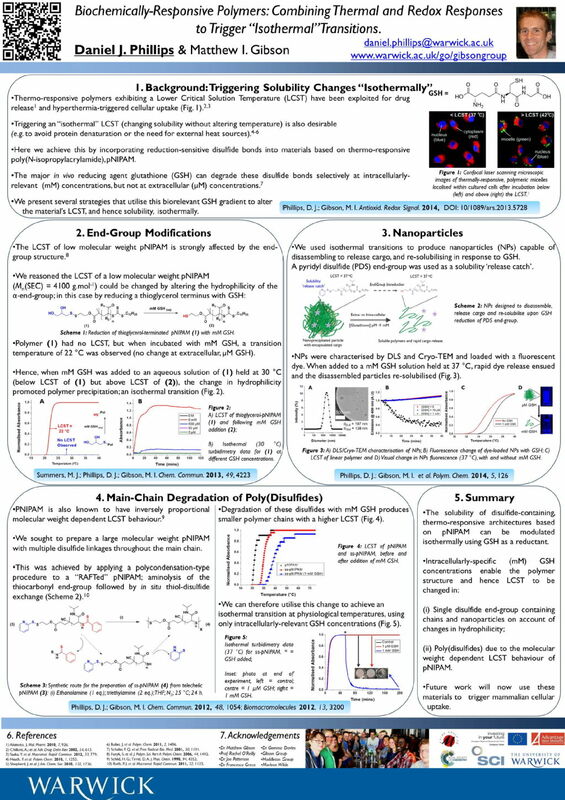 In October 2014, Dan was awarded an Institute of Advanced Study Early Career Fellowship to pursue research in the field of "responsive polymers for drug delivery and diagnostics", a key theme of a PhD thesis which he successfully defended in early 2015. 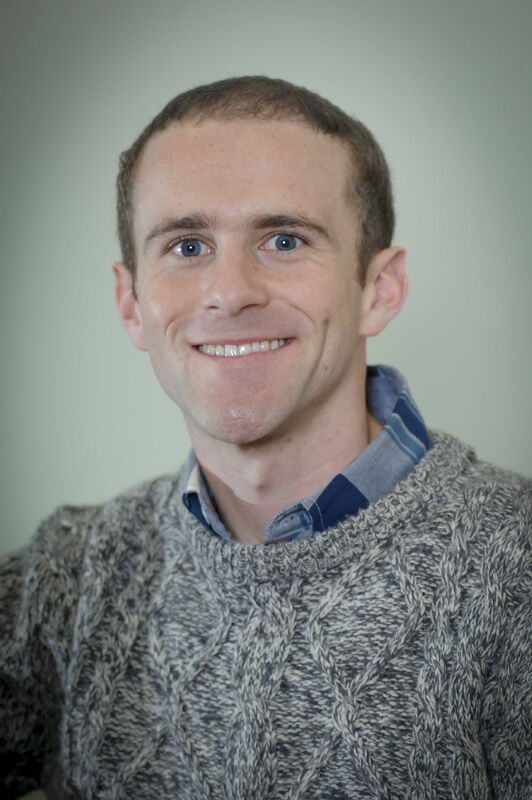 With an interest sparked by his Masters project, Dan's work focusses on the preparation of "stimuli-responsive materials" with triggerable activity to assist with the crossing of cell membranes. A truly multi-disciplinary project, this work encompasses organic, polymer and biomaterials chemistry, together with cell biology. He also has a strong background in Scientific Communication and outreach activites, helping make science more accessible to young scientists of all ages and backgrounds. Phillips, D. J.; Gibson, M. I. Towards Being Genuinely Smart: ‘Iso-Thermally-Responsive’ Polymers as Versatile, Programmable, Scaffolds for Biologically-Adaptable Materials. Polymer Chemistry 2015, DOI: 10.1039/C4PY01539H. Phillips, D. J.; Davies, G.-L.; Gibson, M. I. Siderophore-Inspired, Nanoparticle-Based Biosensor for the Selective Detection of Fe3+. Journal of Materials Chemistry B 2015, 3, 270-275. Phillips, D. J.; Prokes, I.; Davies, G.-L.; Gibson, M. I. Isothermally-Responsive Polymers Triggered by Selective Binding of Fe3+ to Siderophoric Catechol End-Groups. ACS Macro Letters 2014, 3, 1225-1229. Wilkins, L. E.; Phillips, D. J.; Deller, R. C.; Davies, G.-L.; Gibson, M. I. Synthesis and Characterisation of Glucose-Functional Glycopolymers and Gold Nanoparticles: Study of their Potential Interactions with Red Blood Cells via the GLUT-1 Transporter. Carbohydrate Research 2014, DOI: 10.1016/j.carres.2014.09.009. Jones, M. W.; Otten, L.; Richards, S.-J. ; Lowery, R.; Phillips D. J.; Haddleton D. M.; Gibson, M. I. Glycopolymers with secondary binding motifs mimic glycan branching and display bacterial lectin selectivity in addition to affinity Chemical Science 2014, 5, 1611-1616. Phillips, D. J.; Gibson, M. I. Redox-Sensitive Materials for Drug Delivery: Targeting the Correct Intracellular Environment; Tuning Release Rates and Appropriate Predictive Systems. Antioxidants and Redox Signalling 2014, 21, 786-803. 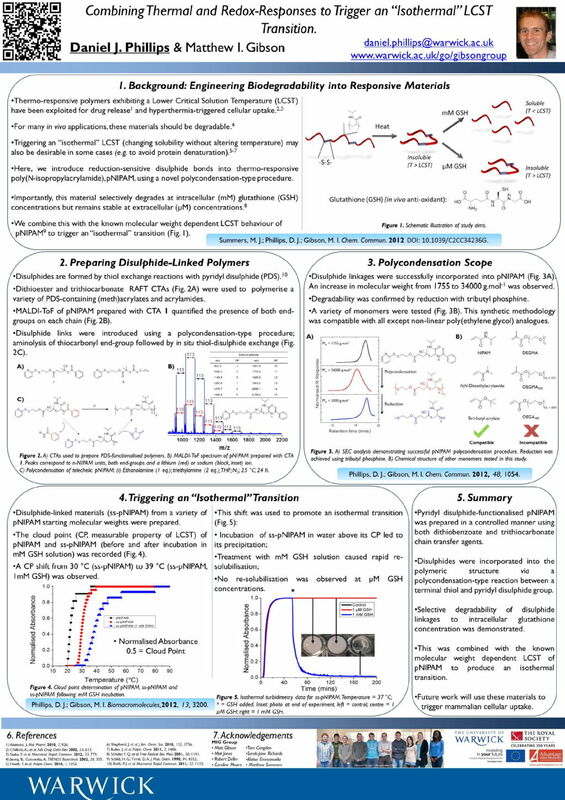 Phillips, D. J.; Patterson J.; O'Reilly, R. K.; Gibson, M. I. Glutathione-Triggered Disassembly of Isothermally Responsive Polymer Nanoparticles obtained by Nanoprecipitation of Hydrophilic Polymers. Polymer Chemistry 2014, 5, 126-131. Summers, M. J.; Phillips, D. J.; Gibson, M. I. 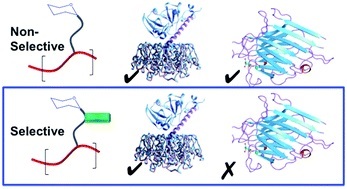 "Isothermal" LCST Transitions Triggered by Bioreduction of Single Polymer End-Groups. Chemical Communications 2013, 49, 4923-4925. Liu, M.; Tirino, P.; Radivojevic, M.; Phillips, D. J.; Gibson, M. I.; Leroux, J. C.; Gauthier, M. A. Molecular Sieving on the Surface of a Protein Provides Protection without Loss of Activity. Advanced Functional Materials 2013, 23, 2007-2015. Phillips, D. J.; Gibson, M. I. Biodegradable poly(disulfide)s derived from RAFT polymerization: Monomer scope, glutathione degradation and tunable thermal responses. Biomacromolecules 2012, 13, 3200-3208. Phillips, D. J.; Pygall, S. R.; Cooper, V. B.; Mann, J. C. Overcoming sink limitations in dissolution testing: a review of traditional methods and the potential utility of biphasic systems. Journal of Pharmacy and Pharmacology 2012, ​64, ​1549-1559. Phillips, D. J.; Pygall, S. R.; Cooper, V. B.; Mann, J. C. Towards Biorelevant Dissolution: An Application of a Biphasic Dissolution Model as a Discrimination Tool for HPMC Matrices Containing a Model BCS Class II Drug. Dissolution Technologies 2012, 19, 25-34. Ieong, N. S.; Hassan, M.; Phillips, D. J.; Saaka, Y.; O'Reilly R. K.; Gibson, M. I. Polymers with Molecular-Weight Dependent LCSTs are Essential for Cooperative Behaviour. Polymer Chemistry 2012, 3, 794-799. Phillips, D. J.; Gibson, M. I. Degradable thermoresponsive polymers which display redox-sensitive LCST behaviour. Chemical Communications 2012, 48, 1054-1056.